This was exactly the kind of project that Brian hates…. a perfect Pinterest project… the kind that validates my hoarder tendencies. So here I had this sample door that I got to take home and drag around to compare to tile and paint chips and granite… and it ended up getting moved around for a month or two…. then it disappeared. I came across it some time later in the basement and Brian tried to throw it away. I wanted to keep it if for no other reason than it was pretty and wood and I figured I’d think of something to do with it someday. So I hid it in my craft room until I came across an idea on Pinterest to paint cabinet doors with chalkboard paint. Brian always gets annoyed with my Pinterest Projects because he says that you have to go out and buy twenty different things to make them because no one except for this one blogger has this stuff lying around their house. Well… today, I am that blogger. Ha! 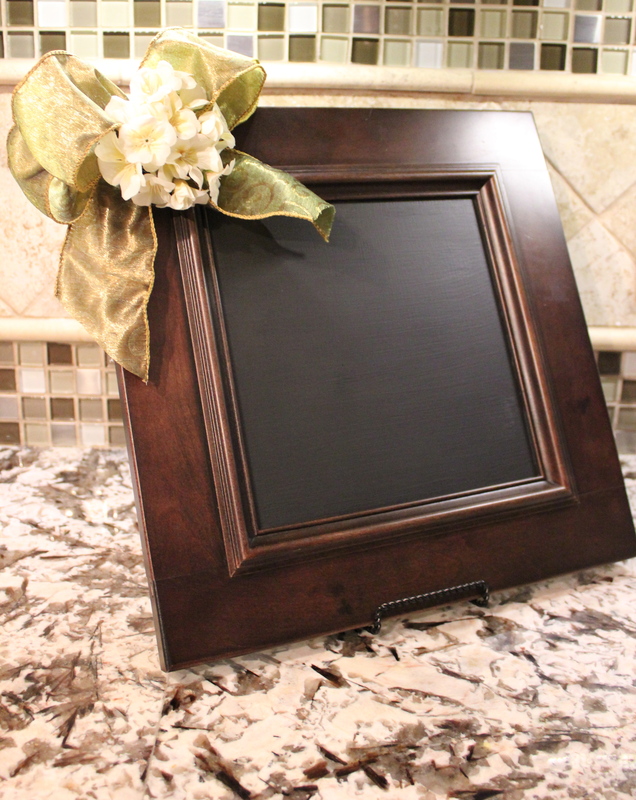 I made this chalkboard door without having to buy anything (except an entirely new kitchen to get this sample door…).